After giving many seminars it never seems to shock me how many people feel that they are not worthy. Not worthy to succeed, or to experience love. Not worthy of abundance, happiness, or to even be on the planet. So many things can make anyone feel unworthy; you may have a dark past, or maybe you’re riddled with guilt. 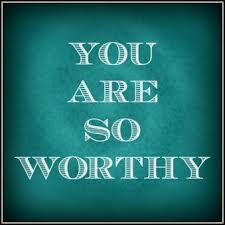 Possibly you’ve been told you’re not worthy or hurt so badly you just figured you couldn’t be worthy. Perhaps you are the one who caused the pain, either way it’s time to stop this mind-set. This statement is so perfect, no matter what you’ve done, change now, recover by never doing it again, by loving more, by reaching out and helping others. If you’ve been hurt it’s time to do your best to move forward, and surround yourself with wonderful, caring people. But by doing nothing, that only adds to the negativity of the planet. Be strong, forgive and ask for forgiveness, shine out your gifts and share your self with others, you are definitely worthy.